Saturday January 26, opening reception 2-4, Artist talk March 3, 2pm. “A Woman’s Work… Interior/Exterior Exploration” examines viewpoints of six accomplished women-artists: Stephanie Roberts-Camello, Betty Canick, Leslie Graff, Pamela Lawson, Michelle Lougee, and Carole Rabe. The title is also a play on the phrase “a woman’s work is never done.” Each artist is tied to the theme by interpreting nature or using architectural elements in their work. Pamela Lawson and Michelle Lougee explore natural environments of sea creatures and worker bees. Leslie Graff and Carole Rabe capture domestic surroundings of the American home. Stephanie Roberts-Camello and Betty Canick incorporate both interior and exterior worlds. 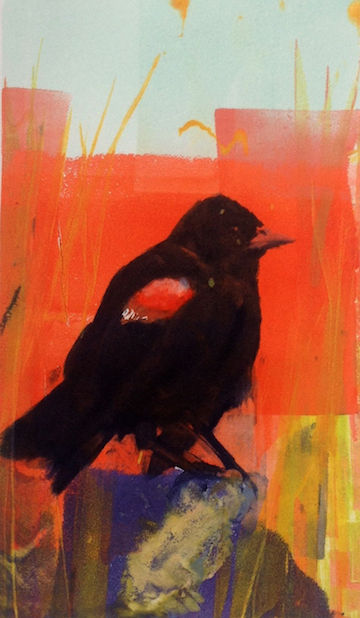 Concord Art Association will be hosting a demonstration of the monotype process, beginning at 10:30am on Wednesday Oct. 9. I’ll work with the techniques that I’ve been using to produce the blackbird series. The exhibit New Works on Paper opened April 19 2008 at Powers Gallery with a reception from 4-7PM. It continued through May 11.